Shake off the January blues with three days of fabulous food, delectable wines, rocking entertainment and of course a sparkling crowd. The wildly anticipated annual London Wine and Food Show http://www.westernfair.com/shows/winefood.html is back again to rave reviews and keen expectations by one and all. With over 50,000 entries, finally the moment had arrived and we have a lucky winner for the Lifestyle Package Destination to EGYPT for 2.Value. $10,000.00! Listen to the show and see if it was you! Toast the New Year with the Champagne of Icewine….Sparkling Icewine! My husband and I will be celebrating New Year’s Eve at a dinner party hosted by a great friend and superb chef! I have heard of icewines, although never tasted one, and just learned that there are also sparkling icewines. https://www.thewineladies.com/wp-content/uploads/2017/08/WineLadiesLogoTransparent.png 0 0 Susanne Seelig-Mense https://www.thewineladies.com/wp-content/uploads/2017/08/WineLadiesLogoTransparent.png Susanne Seelig-Mense2009-12-27 12:00:012009-12-27 12:00:01Toast the New Year with the Champagne of Icewine....Sparkling Icewine! Calorie counting Santa selects a glass of red wine for the holidays! As I indulge in one of my favorite holiday beverages, an eggnog and rum cocktail, I take note of my clothing becoming increasingly tighter. With a number of cocktail parties and dinners yet to attend I wonder if a glass of wine (or two) might be a more prudent choice? I’m sure that it would, but by how much I wonder? What is the caloric count of wine, and are some less fattening than others? How would a mixed drink compare as well? https://www.thewineladies.com/wp-content/uploads/2017/08/WineLadiesLogoTransparent.png 0 0 Susanne Seelig-Mense https://www.thewineladies.com/wp-content/uploads/2017/08/WineLadiesLogoTransparent.png Susanne Seelig-Mense2009-12-18 12:00:012009-12-18 12:00:01Calorie counting Santa selects a glass of red wine for the holidays! Riedel Bird Decanters offer dramatic flight of fantasy for your table. What is a Bird’s decanter? https://www.thewineladies.com/wp-content/uploads/2017/08/WineLadiesLogoTransparent.png 0 0 Susanne Seelig-Mense https://www.thewineladies.com/wp-content/uploads/2017/08/WineLadiesLogoTransparent.png Susanne Seelig-Mense2009-12-18 12:00:012009-12-18 12:00:01Riedel Bird Decanters offer dramatic flight of fantasy for your table. Buy the perfect gift for your wine lover, the Vinturi wine aerator. If you’re looking for a sleek looking, quick and easy, affordable and portable wine decanter your search is over. The Vinturi Essential Wine Aerator is all of that and more. Perfect for decanting just one glass if that’s your pleasure, this light, hand held aerator draws in the proper amount of air for the proper amount of wine. Simply hold the Vinturi over the glass and pour. It’s easy, it’s immediate and it allows for individuals to decide uniquely if they would like their glass of wine decanted or not. You’ll notice a better bouquet, enhanced flavours and smoother finish. It’s that fast. It’s that easy. Have your Vinturi on hand for all wine openings to enhance the flavour of your wine. The handy travel pouch allows you to bring your Vinturi to restaurants, dinner parties, a girls night out and more. Included in the beautiful gift box is a no-drip stand and a travel pouch. Acrylic aerator and stand are dishwasher safe. The travel pouch is machine washable. Order your Vinturi on line here now. Visa accepted. Delivery within 5 days. Bernoulli’s Principle states that as the speed of a moving fluid increases, the pressure within the fluid decreases. This is dictated by the law of conservation of energy. When wine is poured in the Vinturi, it’s internal design creates an increase in the wine’s velocity and a decrease in its pressure. This pressure difference creates a vacuum that draws in air which is mixed with wine for perfect aeration. Sample the nose. You’ll appreciate the subtle aromatic differences and the full aroma of the wine. Vinturi allows wine to display its intended aromas. Go ahead, take a sip. Vinturi’s wine tastes better. It is more flavourful and has better mouth feel. It tastes like a richer, more expensive wine. It tastes like it was intended to and is more enjoyable. https://www.thewineladies.com/wp-content/uploads/2017/08/WineLadiesLogoTransparent.png 0 0 Susanne Seelig-Mense https://www.thewineladies.com/wp-content/uploads/2017/08/WineLadiesLogoTransparent.png Susanne Seelig-Mense2009-12-14 12:00:012009-12-14 12:00:01Buy the perfect gift for your wine lover, the Vinturi wine aerator. Set that dial to CP24 Radio1050 ( 1050 am radio dial) every Saturday morning at 10a.m. or online all week long at https://thewineladies.com/wine_dine/radio_show to connect with The Wine Ladies radio show. After the success of our first web TV show, “Talking Wine with the Stars”, filmed during the 2009 Toronto International Film Festival, we are currently producing our second series of two-on-one interviews – this time featuring celebrities and leading business entrepreneurs, financial gurus, sports stars and innovators in the entertainment, literary and fine arts communities. “One Sip At A Time!” is filmed live, on location at some of the most exclusive hospitality venues here in Toronto, Canada and the world! Our first episode featured the 2009 Crystal Award winners shot on location at the stunning Fairmont Royal York Hotel in Toronto. All these award winners are a testament to hard work, passion, and creativity for Women in Film & Television-Toronto (WIFT-T). We were honoured to meet them all and to celebrate their achievements. What a thrill to meet each and everyone of these wonderful, accomplished women! Creative Excellence Award winner TASSIE CAMERON, Screenwriter & Producer, was the first to drop by and share her stories, next was LISA MEECHES, Executive Producer, President, Eagle Vision Inc., Meeches Video Production Mentorship Award followed by Outstanding Achievement Award winner CHRISTINE SHIPTON, Senior Vice President, Drama/Factual Content, Canwest Broadcasting. All the award winners are a testament to hard work, passion, and creativity. And finally, the lady the legendary, iconic Canadian actress of film, TV and theater SHIRLEY DOUGLAS, International Achievement Award winner who truly captivated us with her charm and wit. https://www.thewineladies.com/wp-content/uploads/2017/08/WineLadiesLogoTransparent.png 0 0 Susanne Seelig-Mense https://www.thewineladies.com/wp-content/uploads/2017/08/WineLadiesLogoTransparent.png Susanne Seelig-Mense2009-12-07 12:00:012009-12-07 12:00:01Lights, Camera, Action! The Wine Ladies launch new web TV "One Sip At A Time"! Red wine stains! No worries! Winning Colours Stain Remover to the rescue! With the holidays upon us there are lots of parties, family dinners and glittering soirees. This of course involves having friends and family over, visiting pets, cracking open your finest wardrobe and of course lots of wonderful food, wine and more. With all of the extra commotion there will be sure to be lots of accidental spills and messes to be handled. 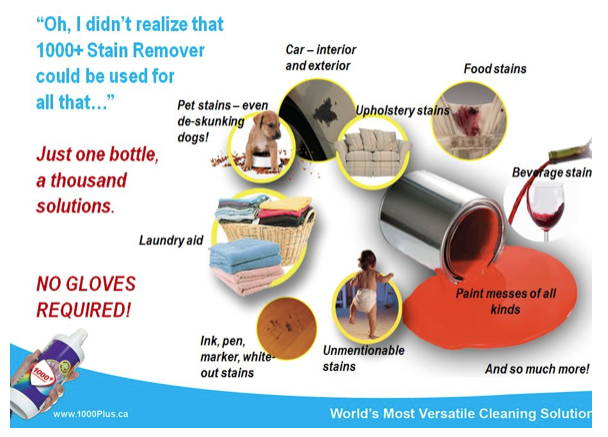 We wanted to make sure you are aware of one of the very best stain removers out there in the market place. 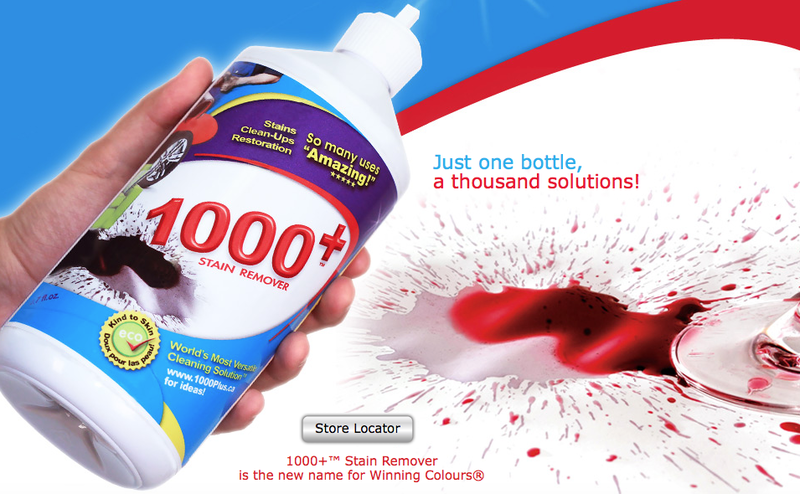 It’s called Winning Colours Stain Remover from Winning Brands and just as the bottle claims it has over a 1000 + uses! From pet stains, blood, paint, grease, shoe polish, coffee to red wine stains! It’s happened time and time again, the wine is flowing and everyone is having a great time. In an instant it all changes. Like a slow motion movie, the wine glass is knocked over filled with red wine. It covers the white table cloth in a sea of red and drips down to the to the chairs and carpet! Boy does that ever spoil a good party! Not too worry as Patricia Miles Marketing Manager stated and demonstrated recently on the radio show. Simply apply the stain remover, add water ( the secret ingredient) and its gone! Winning Colours Stain Remover is also kind to the environment and is eco friendly. It is made with all natural ingredients including Bananas. It really works we have seen it for ourselves! 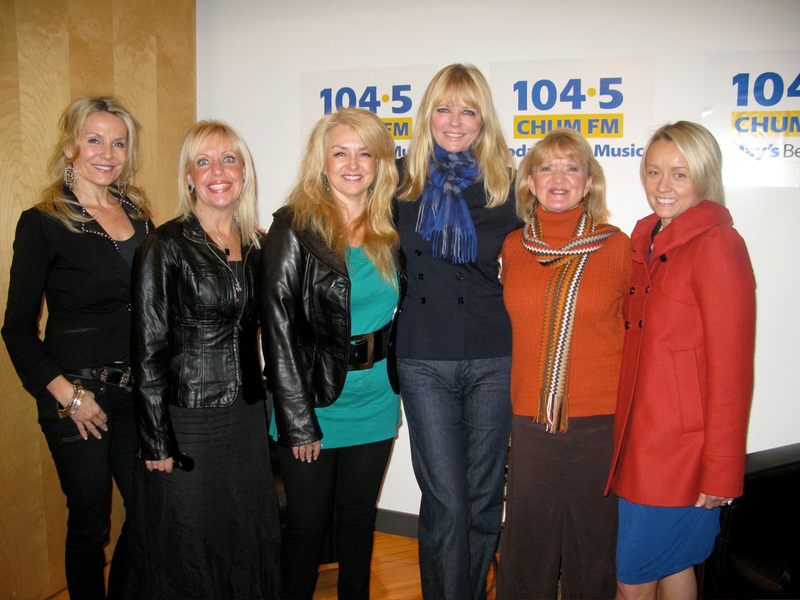 Super model Cheryl Tiegs who has been practising green for years was also on the show. She was impressed with Winning Colours Stain Remover! 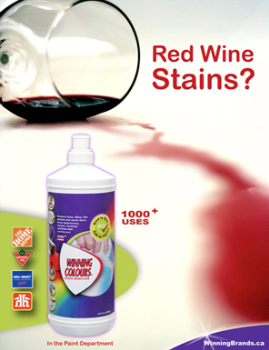 We found some great videos that showcase this exceptional Winning Colours Stain remover taking out a red wine stain. Winning Colours Stain remover taking out coffee, wine, strawberries and so much more. https://www.thewineladies.com/wp-content/uploads/2009/12/Screen-Shot-2018-04-27-at-9.58.44-AM.png 350 269 Susanne Seelig-Mense https://www.thewineladies.com/wp-content/uploads/2017/08/WineLadiesLogoTransparent.png Susanne Seelig-Mense2009-12-07 12:00:012018-04-27 10:13:33Red wine stains! No worries! Winning Colours Stain Remover to the rescue! The Riviera Maya, breathtaking, historic, adventurous, and delicious!Paradise! https://www.thewineladies.com/wp-content/uploads/2017/08/WineLadiesLogoTransparent.png 0 0 Susanne Seelig-Mense https://www.thewineladies.com/wp-content/uploads/2017/08/WineLadiesLogoTransparent.png Susanne Seelig-Mense2009-12-07 12:00:012009-12-07 12:00:01The Riviera Maya, breathtaking, historic, adventurous, and delicious!Paradise!